The Mumford Motor Driver is a stepper motor driver designed for use with the Moco Time Machine, rotary tables, and track and dolly systems. It is small, light, and will run a stepper motor for many hours on small batteries. A built-in pulse generator can be used to jog the motor or run it continuously at variable speeds. A knob at one end of the enclosure allows you to dial in the speed you want. 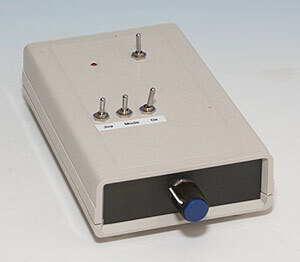 There are four toggle switches on top of the enclosure. One is the power switch. The left one of three turns the jog function on and off. The middle one selects whether the motor is stepped in coarse steps for more greater distances or very fine steps for tiny increments of ramped panning. The third switch sets the direction of rotation. 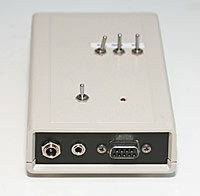 The other end of the enclosure has connectors for a 12 volt battery, an interface cable to the Time Machine, and the stepper motor plug. The Mumford Motor Driver is less than 6 inches long and weighs less than 6 ounces. It will run a stepper motor more than 10 hours on eight "AA" cells. Click here to see a battery life graph. The Motor Driver relies on pan programs in the Moco Time Machine to control the amount of travel between exposures. With the miniature pan head, the minimum increment of travel is .00125 degrees per step. It can also be used with the standard 4" rotary table for a minimum travel of .00156 degrees per step. Both allow for smooth ramped pans. When more aggressive motion is needed, the driver can be switched to a coarse step mode, where each step is eight times larger. Can be configured for unipolar stepper motors up to 2 amps (current is set with a trimmer). It uses a "current chopper" design to limit the current to the motor and is designed to run on 10 to 15 volts DC. Automatically goes into a low current power-saving mode between exposures to extend battery life. A toggle switch selects the direction of rotation. A toggle switch enables a built-in pulse generator for self-contained continuous rotation. A rotary knob sets the speed of continuous rotation. A toggle switch changes the driver from fine steps (microstepping) for ramped pans to larger steps for track and dolly moves. It runs on eight "AA" batteries or any other 12 volt battery you provide. Automatically differentiates single step signals or compressed step commands from the Moco Time Machine.